Welcome to the nineteenth issue of the Columbia College Class of 1963 eNewsletter. The past month has brought many of us together; first at the September 14 Class lunch where 15 of us gathered with a delegation from the Alumni Affairs Office (more below), and then at the Homecoming Game on September 30 where I saw Doug Anderson, Steve Barcan, Henry Black, Bill Burley, Gerry Dwyer, Joe Fisher, Ira Malter, Larry Neuman, Tom O'Connor, and Walter Stein. I heard Phil Satow was in the crowd, but I missed him. Let me know if you were also there. I think this may be a record attendance for our class! You can see some pictures if you click here. Larry Neuman attended with his son, Andreas '98, who is still in the US Air Force, but is hoping to go in the Reserves and start flying commercial aircraft soon. Bill Burley has been an educator and school superintendent in Massachusetts. He is also plays the bagpipes and is the official piper for the Penn Club of New York (Bill, don't you think the Columbia Club deserves one?). His card says that he is available for Weddings, Funerals, Interments, Birthdays, Anniversaries, and Instruction (he also confided to me that he plays Bar Mitzvahs). Here is a picture of Bill in his full regalia. Walter Stein is out of his rigid neck brace and into a soft one. He continues to improve, and now can drive again. Henry Black flew in from Chicago with his wife, but will be making the move to NYC permanent in a few months. Joe Fisher made his annual pilgrimage up from Virginia, and was disappointed that more of his ADP brothers were not in attendance. I'd rather not talk about the game other than to say that we had a great crowd, and Princeton had the smallest visiting crowd I've seen since they built the Wein Stadium. As I mentioned last month, I have posted this issue of our eNewsletter on our new web site, www.cc63ers.com. As the College and University work out their plans for the future of the Columbia online alumni presence, I thought it prudent to start up an independent, easily controllable environment. Over the next few years I hope that it will grow into a rich resource for our class. I am hoping that a few of you will join me on working on this site (knowing the talent in this class, I'm counting on it). I'll be sending out a separate email to all of you in week or with more information. In the meantime, let me know if what I have moved there so far (I'm slowly migrating the archives of this eNewsletter over) seems to be working correctly. The next step is a nicely designed home page (which I haven't had a chance to work on this month), and sections for all sorts of goodies. Let me know what you think. You can always email me at pauln@helpauthors.com. Please join your classmates for an informal lunch at the Columbia Club every second Thursday of the month. It is our hope that these gatherings will renew old friendships and foster improved relationship with our class and the College. I hope you can all join us at the next lunch on Thursday, October 12. Let me know if you will attend so that we can reserve a big enough table; RSVP to Paul Neshamkin (pauln@helpauthors.com). Last month's gathering was special. We had invited Derek Wittner '65, Dean of Alumni Affairs and Development; Susan Birnbaum, Executive Director, Columbia College Fund; and Karri Brady, the Columbia College Fund Director recently assigned to our class, and 25 classmates joined in an interesting (and early) discussion of our plans for the 45th Reunion and the 50th Reunion. Several ambitious members of our class felt it important to talk this over well in advance, and start planning for what we hope will be a major contribution to Columbia over the next 7 years. Our largest Class of 1963 lunch attended (15 classmates!) including: David Alpern, Steve Barcan, Peter Broido, Gerry Dwyer, Doron Gopstein, Paul Gorrin, Bob Heller, Bruce Kaplan, Barry Landau, Paul Neshamkin, Larry Neuman, Tom O'Connor, Barry Reiss, Phil Satow, and Herb Soroca. (From left to right) Seated: Barry Landau, Peter Broido, Paul Gorrin, Doron Gopstein, and Gerry Dwyer. 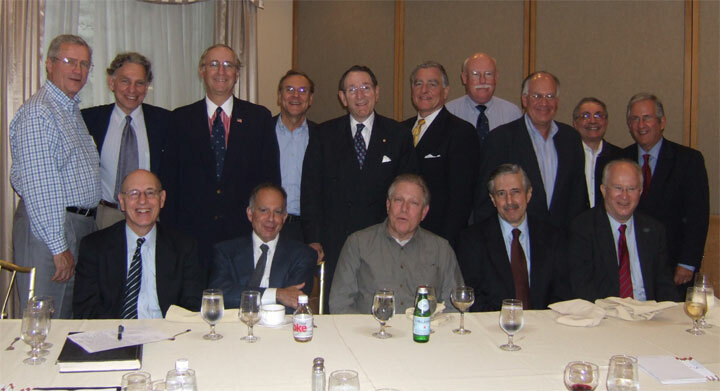 Standing: Tom O'Connor, Larry Neuman, Bruce Kaplan, Phil Satow, Bob Heller, Herb Soroca, Paul Neshamkin, David Alpern, Barry Reiss, and Steve Barcan. Guess what? Nobody has sent any news this past month. Other than some gossip from the Homecoming game (see above), I have nothing to pass on. Please send me some news or the next issue of Columbia College Today is going to have an empty column for the Class of '63.